Rita Ann Higgins was born in 1955 in Galway, Ireland. She divides her time between Galway City and Spiddal, County Galway. 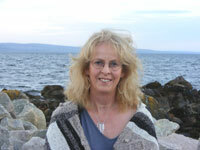 Her first five collections were published by Salmon: Goddess on the Mervue Bus (1986); Witch in the Bushes (1988); Goddess and Witch (1990); Philomena's Revenge (1992); and, Higher Purchase (1996). Bloodaxe Books published her next three collections: Sunny Side Plucked (1996); An Awful Racket (2001); and Throw in the Vowels: New & Selected Poems in May 2005 to mark her 50th birthday. Her plays include: Face Licker Come Home (Salmon 1991); God of the Hatch Man (1992), Colie Lally Doesn't Live in a Bucket (1993); and Down All the Roundabouts (1999). In 2004, she wrote a screenplay entitled The Big Break. In 2008 she wrote a play, The Empty Frame, inspired by Hanna Greally, and in 2008 a play for radio, The Plastic Bag. She has edited: Out the Clara Road: The Offaly Anthology in 1999; and Word and Image: a collection of poems from Sunderland Women's Centre and Washington Bridge Centre (2000). She co-edited FIZZ: Poetry of resistance and challenge, an anthology written by young people, in 2004. She was Galway County's Writer-in-Residence in 1987, Writer-in-Residence at the National University of Ireland, Galway, in 1994-95, and Writer-in-Residence for Offaly County Council in 1998-99. She was Green Honors Professor at Texas Christian University in October 2000. She won the Peadar O'Donnell Award in 1989 and has received several Arts Council of Ireland bursaries. Her collection Sunny Side Plucked was a Poetry Book Society Recommendation. She was made an honorary fellow at Hong Kong Baptist University in November 2006.
when there was no somewhere to go. and Camden Town and further afield. what harm was it for God’s sake. with a belly full of baby. to receive the body of Christ. of them beauties onto her palm. let her only son kiss the face of a raging truck. and cycle the last mile. where there was no somewhere to go. to polish and die for. TAKING US from the harsh realities of Baile Crua to the cautious serenity of the Spiddal bogs, Rita Ann Higgins' new book Hurting God - part essay, part rhyme (Salmon) is a short but intense spiritual autobiography. Starting with the sentence: "The changes are going to be great in Baile Crua," Rita Ann immediately, and without apology, sets out her stall in her normal uncompromising fashion and if Mary Coughlan's 'Delaney Is Back On The Wine' was our introduction to the Shantalla Blues, Rita Ann’s Goddess on the bus to Eyre Square could well be the anthem of the Mervue Blues. The structure of this 70 odd page memoir is unusual, not to say novel, in that a short essay precedes the 10 poems therein. The essays contain most of the autobiographical material while the poems mark the inner reaction of the now mature poet. In their own way, the essays are yet another description of a frightened and confused girl seeking her own identity and who, through the strength of her own personality and the love of people close to her, comes to terms with her childhood and rebellion, finding a sense of personal fulfilment through her art. However, the real power of the book is in the poems. In them we witness the poet’s spiritual growth (which occurs almost despite herself). Initially imbued by Catholic guilt, the first poems in the collection are redolent of helplessness, fear, uncertainty and darkness. Despite this sense of hopelessness, a familial warmth emerges, especially in one of the finest poems in the collection written surprisingly first in Irish, 'An Teanga Eile', and then translated into English. The sheer simplicity and music of this poem, along with the driving beat of the lines, give it a power that leaves the reader breathless. So much so that the author’s English translation, while good in itself, goes nowhere near having the same effect. Recovery is at hand however through love as symbolised by the power of the hug and poetic creation, a serious spiritual self emerges that finally finds that cautious serenity in Spiddal, cautious because the Higgins aesthetic is always waiting for what is around the corner. The essays and poems were written at night after the visits to “Himself” who was being treated for cancer add to their poignancy. The book is a courageous testament as Higgins lays her heart and soul bare and she does so with a wonderful inner strength and a total honesty. 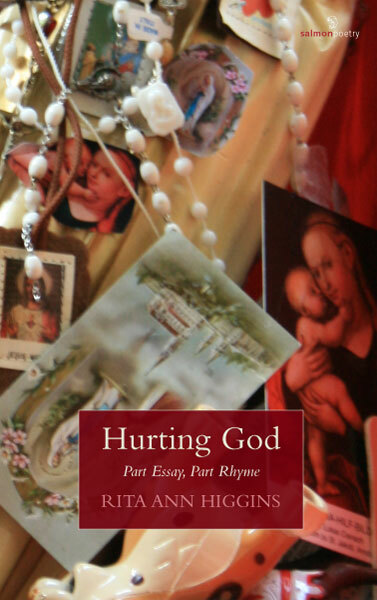 Hurting God is an extraordinary statement bearing witness to a life fearlessly and fully lived. It is a volume of poetry with a serious Galway accent and, to coin the phrase of an erstwhile Woodquay shopkeeper is "mighty, on'y mighty".